Outstanding stainremoval at 30C. If you're looking for brilliant cleaning at temperatures as low as 15°C, then Ariel Actilift Excel Colour & Style Biological washing gel is for you. Easy and convenient to use, the unique gel bottle allows you to dose with high precision with just a squeeze. Unlike some washing powder products, the gel dissolves at the heart of the wash for brilliant cleaning even at low temperatures. Perfect for bright colours. Recommended by Hotpoint. Use together with Lenor fabric conditioners and Unstoppables for an extra boost of softness and freshness. 24 washes based on 37ml per wash.
Brrrilliant colours and cleaning even in a cold wash. Helps you keep your colours bright. The unique super concentrated washing gel targets stains fast even in a quick wash. Protects your clothes and enhances colour vibrancy. Easy and convenient bottle that enables precise dosing with just a squeeze. 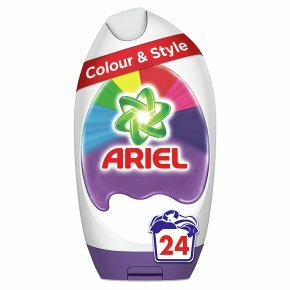 Ariel Colour & Style laundry detergent is available in 3in1 Pods washing capsules, washing liquid and washing powder.Do you want a detergent that delivers Brrrrilliant cleaning and colours in a cold wash? With Ariel's washing gel, you no longer need to choose between cleaning and care. Unlike washing powder this super concentrated detergent activates in cold water and dissolves rapidly even in a quick wash, removing stains and leaving your clothes clean and vibrant. Ariel Colour & Style Gel also helps you keep your colours bright. Use together with Lenor fabric conditioners and Unstoppables, in wash scent booster, for an extra boost of softness and freshness. 24 washes based on 37ml per wash.